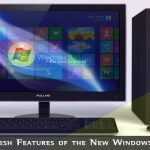 We’ve all witnessed what the hype around Windows 8 (Standard, Pro, and Enterprise) is all about; and we’ve seen how Windows RT – RT being short for runtime – the “lite” incarnation of the much-talked about software also gained the attention of consumers and pundits alike. But what’s the key difference between these different flavors? In this article, we discuss eight (8) key differences between the two that may help you decide which one to get. NOTE: For jargon’s sake, we will refer to “Windows 8” collectively – Windows 8, Windows 8 Pro, and Windows 8 Enterprise are all covered when using this term. Windows RT, while still under the Windows 8 umbrella, is treated as an independent, completely different OS (probably like how the rest of other writers would). Windows 8 is available as a pre-installed operating system on newer personal computers, as a stand-alone software package that comes in retail boxes, and as an all-digital upgrade for those already rocking Windows 7, Windows Vista, or Windows XP. It’s a different case, however, for Windows RT, as it is only offered as a pre-installed OS on Windows-powered devices like the Microsoft Surface and the Asus Vivo Tab. Essentially, Windows RT won’t cost you anything, because you can’t have it without paying for a device that already comes pre-installed with this version of Windows. The participating OEMs or device manufacturers surely paid Microsoft some amount, but perhaps not as significant as, say, what an individual would pay for boxed Windows 8 software. Also, in Windows RT, you don’t need to buy a separate copy of Microsoft Office (Word, PowerPoint, and Excel), because they also come pre-installed in the said OS, whereas with Windows 8, you still need to pay for a separate Office bundle or get a software license to get it running on your Windows 8 PC. As stated above, Windows 8 can be acquired by those currently running pre-Windows 8 environments like Windows 7, Vista, or XP. If you have Windows 7 starter, Home Basic, or Home Premium, you can upgrade to Windows 8; while if you’re on Win 7 Professional or Ultimate, you can switch to Win 8 Pro (and so on). This isn’t possible with Windows RT since it is an entirely new platform. You can’t come from any edition of Win 7 then “upgrade” to Windows RT, because it doesn’t come from a supported older version. Perhaps the most important difference between Windows RT and Windows 8 is the hardware architecture these two platforms require. Windows RT is designed to run on low-powered devices utilizing the ARM architecture, while Windows 8 can run on computers with processors implementing the x86 instruction set. RT isn’t meant to be run natively on Intel or AMD-powerd PCs, while the “real” Win 8 won’t run on ARM-powered devices such as the Surface RT. Windows RT-powered devices are only allowed to run apps downloaded and installed via the Windows Store, while computers running Windows 8 or its various editions are flawlessly compatible with existing Windows programs or what they now call “desktop” applications. You can’t run the RingCentral call controller on your RT device, unless the vendor creates an app and makes it available on the Windows Store or as a web-based app. Note, however, that most apps on the Windows Store are cross-compatible; meaning they can run on both Windows 8 and Windows RT. Both of the OS versions in question sport the new Metro UI and can be switched back to the classic desktop view. But only Windows 8 can be reverted back to the traditional desktop interface in order to access older desktop applications. While Windows RT can be morphed into the classic desktop view, it won’t allow access to apps other than Microsoft’s own (see #5). RT is tablet-optimized and would run only on low-memory devices such as tablets or hybrid convertibles (laptablets). Therefore, it won’t require tons of computing or processing power. As such, devices with RT installed on them are pegged to have extended battery life. You can’t expect the same on Windows 8 (unless you’re using a desktop PC), since you’re using more resources and memory. As previously stated, Windows RT doesn’t require that much processing power from the ARM-based chipsets inside the devices it runs on unlike the full Windows 8, which fires up your processor all-out. This being the case, the RT can perform basic and simple tasks reliably without any hiccups; but Windows 8, along with good hardware specs, will do better in covering all your complex computing process like post-processing photos or editing videos. Keep in mind that Windows 8 is the full-grown baby and Windows RT is its spin-off. Both flavors of Windows 8 have fairly interesting offerings for regular consumers. However, there will always be trade offs no matter which one you choose. But no matter how the differences appear, they won’t be as critical or dramatic once you start patterning them after your needs and preferences. Thanks for sharing this information. I’ve been really thinking of upgrading my OS. I think I’ll have the Windows 8 instead. 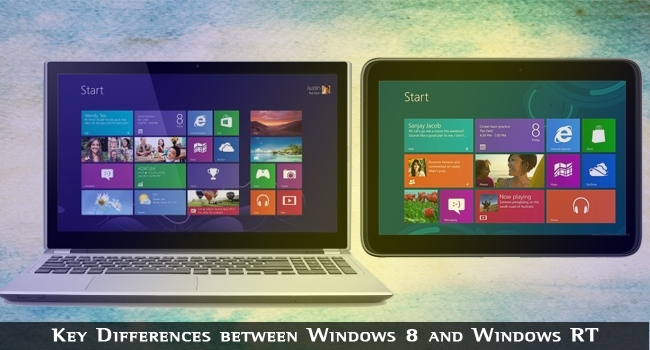 If you’re using Computer then you’ve to use Windows 8 instead of Windows RT as Windows RT is designed for tablets, mobile devices :) Read this article to know more about different Windows 8 editions: Microsoft Revamps Windows 8 Editions for Different Users. There is is big difference in Windows 8 and Windows-RT. I think Windows 8 is the best Windows ever. Good thanks man for sharing a main difference. Brother keep it up. I am personally using Windows 8 and your information so cool. Window 8 is very nice. I am using it because of advance features it has. Thanks for sharing informarion about Windows 8.